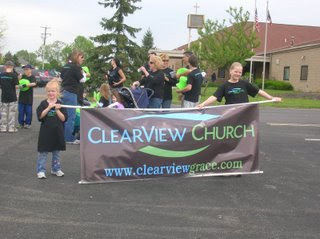 ClearView is a brand new Grace Brethren church in northeastern Franklin County, Ohio, being planted by Andy and Trish Wirt. The Wirts moved to the New Albany/Gahanna area in February of 2007 and began making contacts and working to gather a group of people together to work toward a Grand Opening for ClearView Church in the fall of 2009. ClearView’s goal is to find “25 To Thrive” (25 families to work towards a new church) by fall of 2009. Church-planter Andy Wirt writes, “I was very thankful for our gathering yesterday (4/19). There is always such a good spirit among our ClearView family and I just enjoy being around everyone. There is a genuine care for one another and a willingness to love and serve that is contagious. “Our worship, prayer time, and discussion around Colossians 1 moved me. We also had a strong attendance and several guests, three separate family units, which is always encouraging. I was particularly excited about a friend of mine from the community that came, enjoyed her time with us, and said she’d be back! I had an exciting conversation with her last week–the best kind of interaction–talking about who Jesus is and what He has done for us. For more information on the Clearview church plant, click here.